It’s almost time for the Super Bowl. I am not really a sports fan. But who doesn’t love the delicious appetizers that are served at Super Bowl parties?!? I will watch any football game just to get to the goodies. I have one question though…. is it the game with the round ball or the pointy ball? In honor of Super Bowl parties everywhere, AnnaShortcakes will have a week of posts embracing one of the best food traditions – tapas. Enjoy! I love the Smitten Kitchen. 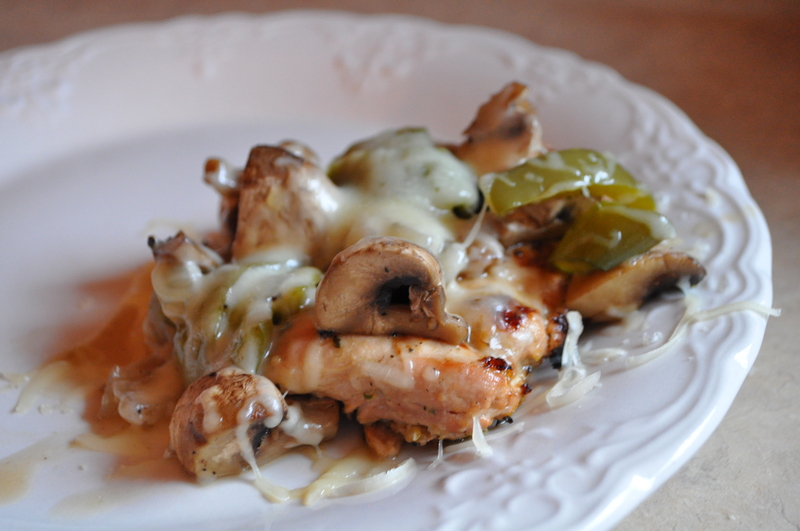 Deb’s recipes and writing style are so approachable. Comfortable. She seems like the neighbor in your apartment building that opens her front door for a quick chat, allowing delicious smells to waft under your nose. 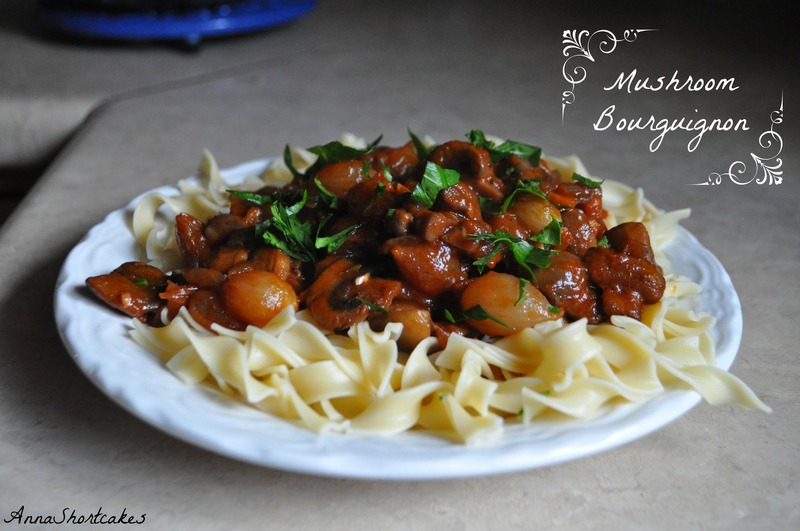 You want to be invited over for dinner, just to see what she will create next. Make the filling: Pour boiling water over shiitake in a small bowl and soak until softened, about 10 to 20 minutes. Drain and squeeze extra water from the mushrooms. Save their water for later. Finely chop onion and garlic in a food processor, then add the mushrooms and continue to process until finely chopped. Heat butter in a skillet over moderate heat until foam subsides. Add the mushroom mixture, stirring frequently until the mushrooms are dry (about 10 minutes). Add the reserved mushrooms liquid to the dry mushrooms. Continue cooking until the mixture is dry again (about 15 minutes). Add parsley, salt and pepper to taste. Set aside to cool. Make the dough: Combine the two flours in a bowl. Make a well in flour and add eggs, salt, and water. Gently stir the eggs and water together, gradually incorporating the flour until a soft dough forms. Turn the dough out onto a floured surface. Knead until the dough is smooth, adding flour as needed to keep it from sticking. Cover with plastic wrap and allow to rest on the countertop for 30 minutes. Dough may be made about 2 hours ahead. Wrap well in plastic wrap and chilled. Bring to room temperature before using. 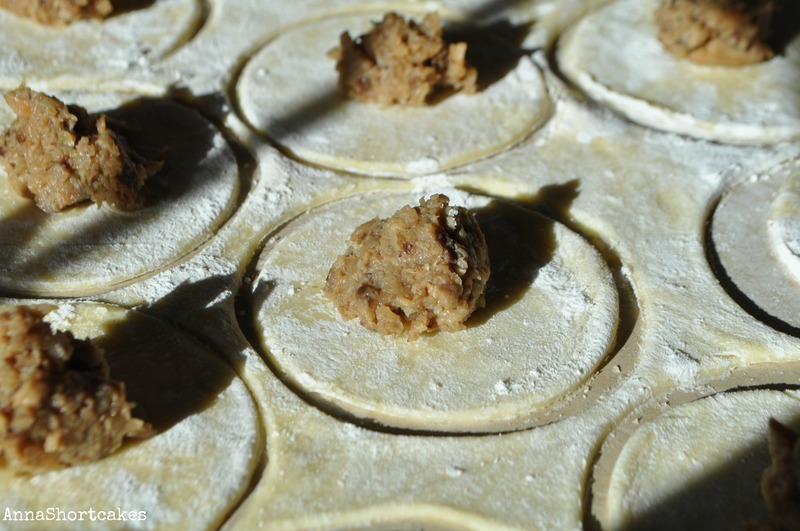 Roll out dough and fill pierogies: Cut the dough in half, wrapping the one piece in the plastic wrap to keep it moist. Roll out the other piece of dough on a lightly floured surface, about 1/8 inch thick or less. Cut into rounds with a 2.5 inch cookie cutter. Place one teaspoon of filling in the center of each round. Moisten 1/2 of the edge of each round. Fold the dough round in half and pinch together- moist side to dry side. Continue until all the dough and filling is used up. 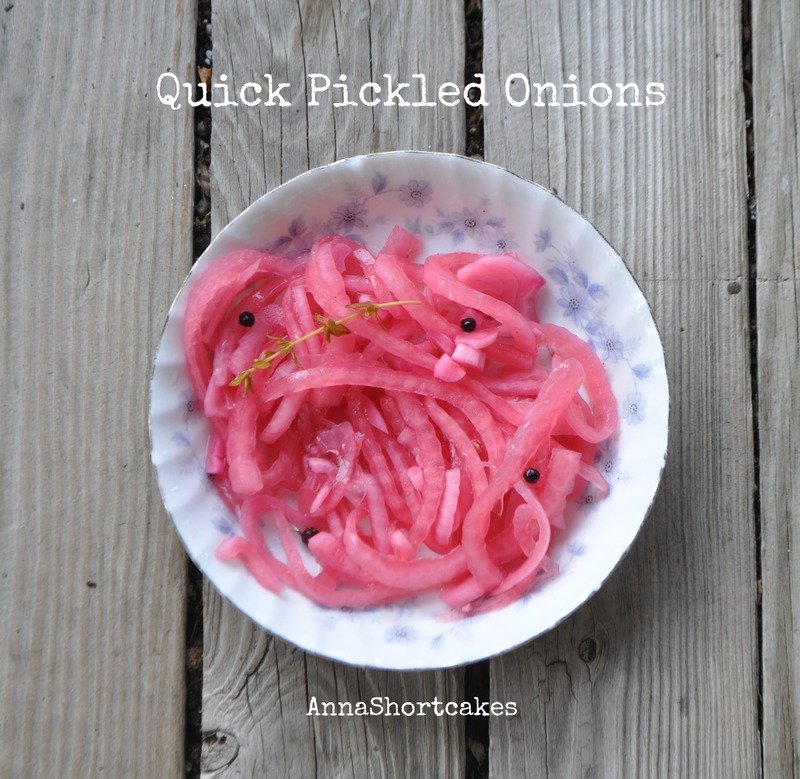 Cook onions and pierogies: Saute onions in butter in a large heavy skillet over moderately low heat, stirring frequently, until golden brown, about 30 minutes. Season with salt and pepper. Remove from skillet and set both aside. Cook pierogies in a large pot of lightly salted boiling water until tender (about 12 to 15 minutes). Transfer with a slotted spoon into the onion skillet. Lightly brown each side of the pierogies in the butter that remains in the skillet. 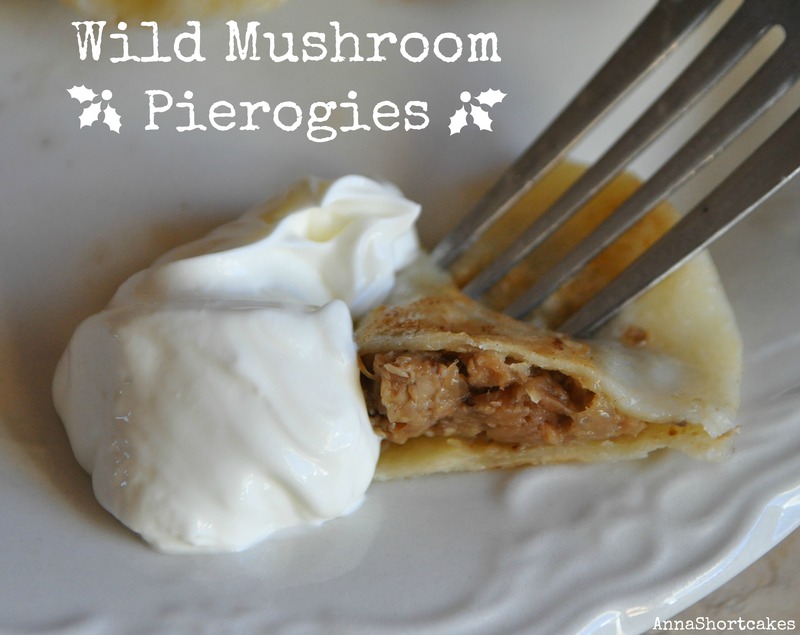 Toss the browned pierogies with the onions and serve with sour cream. Do ahead: Filling can be made up to a week ahead and chilled. 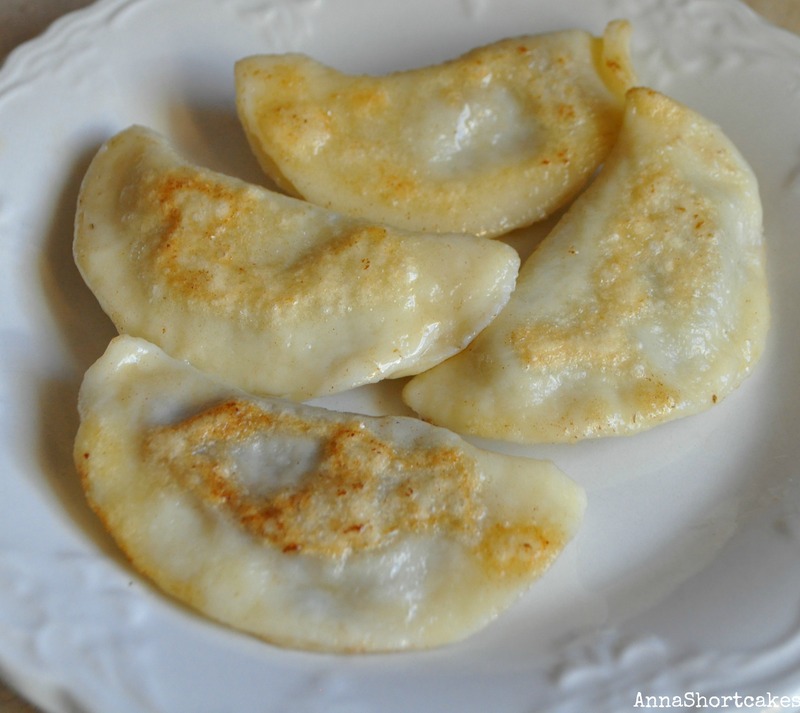 Stuffed pierogies can be frozen on a cookie sheet and then bagged for later use. They last for about a month, if you let them sit there long enough. Thaw before boiling. The Kentucky State Fair is being held in Louisville this week. My husband and I plan to visit on Friday. I am super excited! When I was a kid, my grandparents used to take my siblings and I every year. We would have a group discussion about when we should go- the beef cattle week or the dairy cattle week. (There are many points to consider here. 1) We grow beef cattle. Do we really want to see what we know already? 2) What other animals are there this same week? Pigs? Fowl? Goats? Sheep? Mules and horses? 3) What did we see last year? There are other points but you get the idea.) We would get up really early and make the two hour drive to the fairgrounds. Then we would meander around for hours, looking at all the exhibits. Some of them twice. On the way home, we would discuss the whole experience and each try to pick out our favorite part of the day. This usually occupied us until we got home or we fell asleep. Food was also a big point of consideration. Under the food tent are so many things that need careful consideration. Which to choose – pork or beef or catfish or mutton from their local producers? Do we leave room for the Erhler’s ice cream later in the afternoon? My grandfather usually picked a rib eye steak sandwich while my grandmother chose a pork burger. In honor of these precious memories, I decided a pork burger would be a nice change from our usual beef burger. The texture of a pork burger is somewhat different. 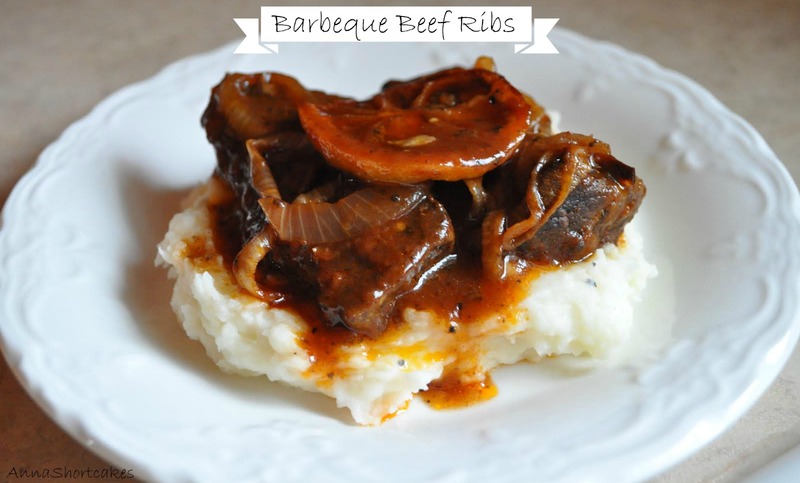 The meat is more tender and less grainy in texture. The pork is a more subtle flavor that can be easily complimented with spices, such as the cumin I used here. Prepare your charcoal grill to medium high heat. In a bowl, combine the pork with the cumin. Form into 4 patties. Make a foil packet to hold the onions, peppers, and the olive oil. Season with salt and pepper. Grill the burgers until the juices run clear, about 5 minutes on each side (maybe a bit longer depending on how hot your grill is). Grill the veggie packet until the veggies are tender. On the toasted buns, add a burger. 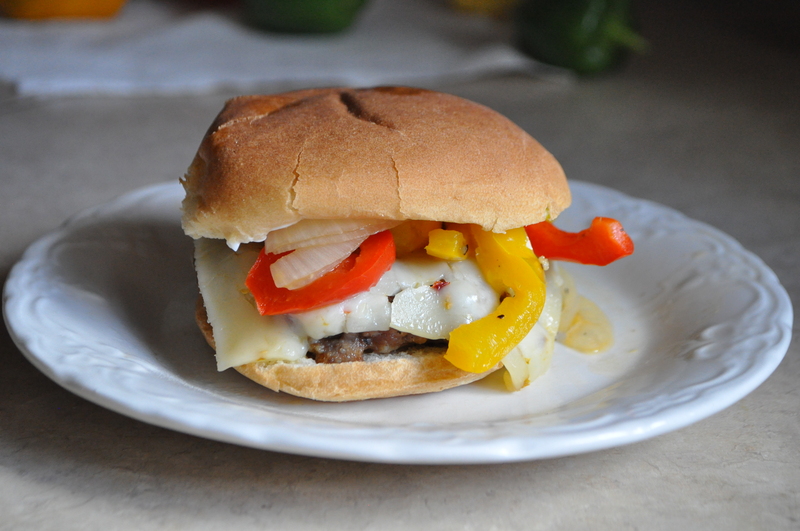 Top with a slice of cheese and a good amount of the peppers and onions. Use other condiments if desired (I used mayo). Serves 4. This salad is my new favorite!! LOVE IT! It is like a flavor explosions in your mouth. I am obsessed with it now. I could eat a huge bowl of this every day. Now I know that it is not totally traditional. I don’t have purslane and sumac. Maybe one day I’ll have it the “real” way but until then I will be perfectly content to eat my own version. Wash and tear up the romaine leaves. 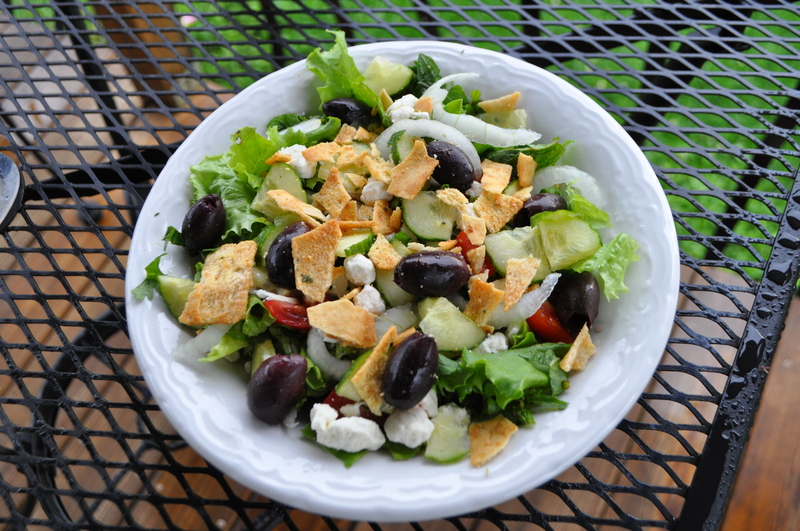 Top with your sliced onion, tomatoes, cucumber, mint, cilantro, parsley, olives and feta. Crumble up your desired amount of pita chips. Drizzle the desired amount of lemon garlic vinaigrette over the salad. Serves 1. My dear in-laws gave me an ice cream bucket full of new potatoes last week. They are divine. I tend to make simple recipes with new potatoes. I prefer to let their gorgeous flavor and texture shine though. These potatoes are about as simple as they can get but they are packed with amazing flavor. Preheat oven to 400 degrees. 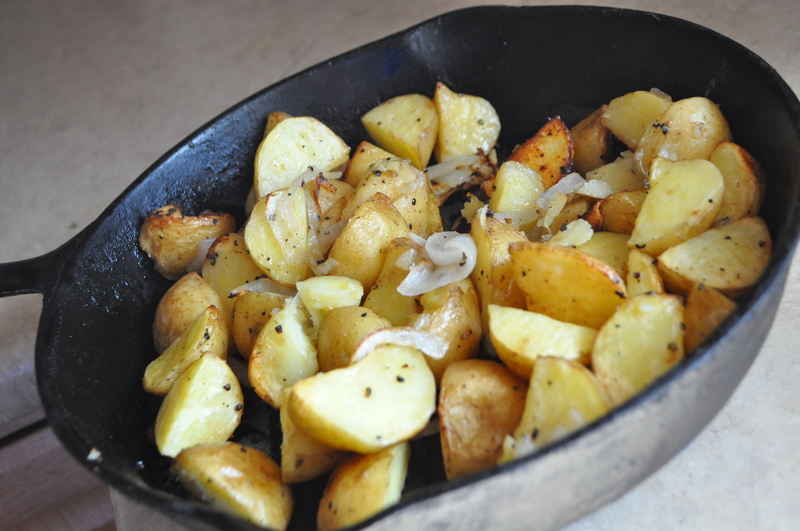 In a cast iron skillet, add your onions and potatoes. Toss in desired amount of olive oil (don’t use too much as you will be adding more oil later). Bake until potatoes are tender, stirring half way through (about 30 minutes). Remove potatoes from the oven and add the truffle oil. Toss to distribute evenly. Now would be the time to add fresh truffle shavings if you were lucky enough to have those. Adjust salt and pepper if needed. Enjoy! This is a sandwich that would make Dagwood proud. Beefy, porky, cheesy, and greasy. It’s not the boring ham and cheese on white bread sandwich that we all dread coming home to but it is almost as quick to assemble. 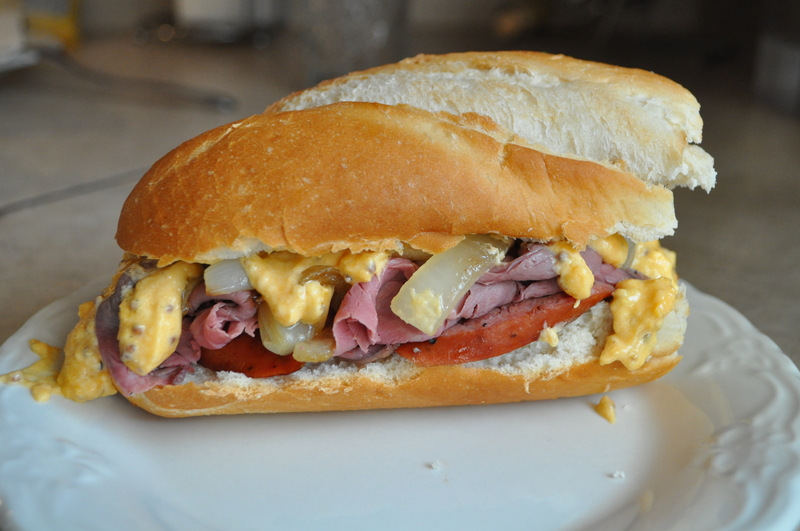 I really like the cheddar sauce and plan to use it on other sandwiches. These would be a great thing to serve and your NCAA basketball championship party or similar such events. In a heavy bottomed skillet, saute the onions until starting to brown. Fry the sausage until lightly browned. In a bowl, combine sauce ingredients. 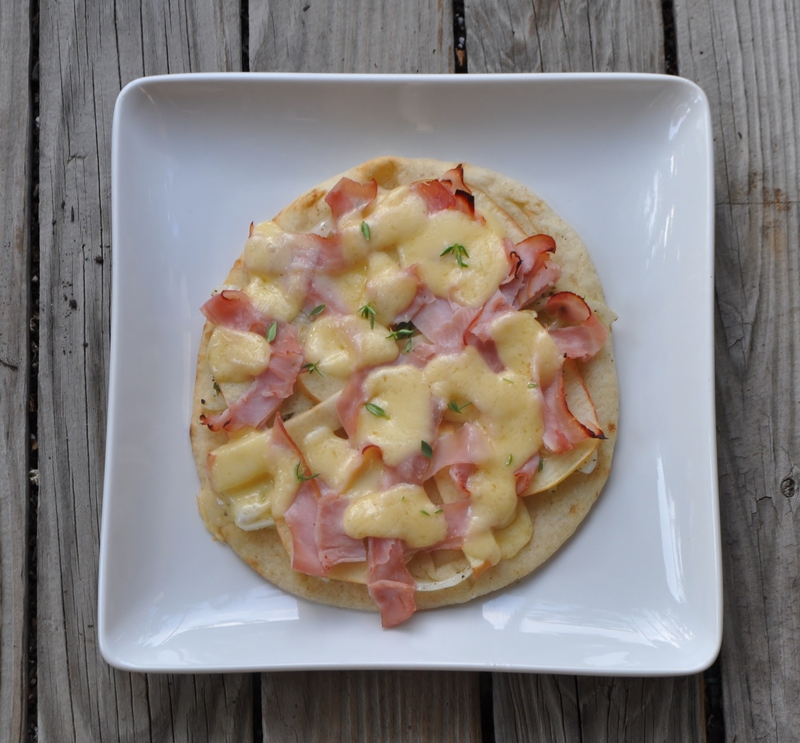 Place in microwave for about 10-15 seconds, until cheese is melted. Whisk until totally combined and melted cheese is blended into sauce. To assemble the sandwiches, layer the onion, beef and sausage. Top with several dollops of the sauce. Makes about 6 sandwiches.